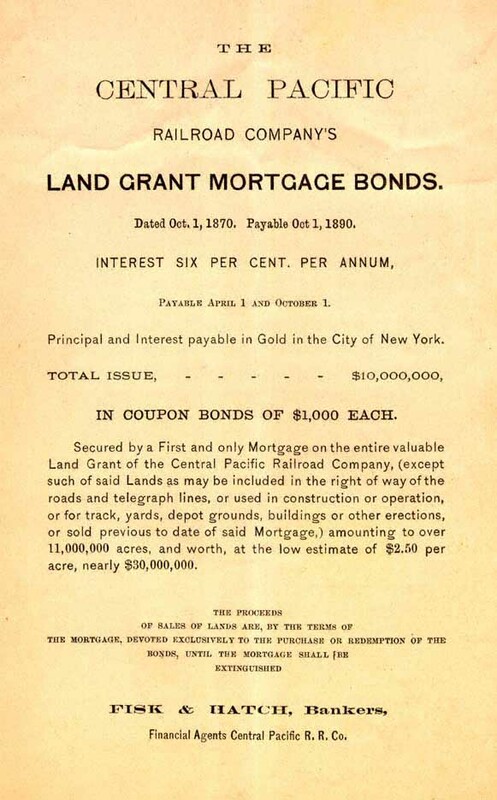 CPRR Railroad Bond Prospectus, Oct. 1, 1870, Cover. Courtesy Bruce Clement Cooper Collection. 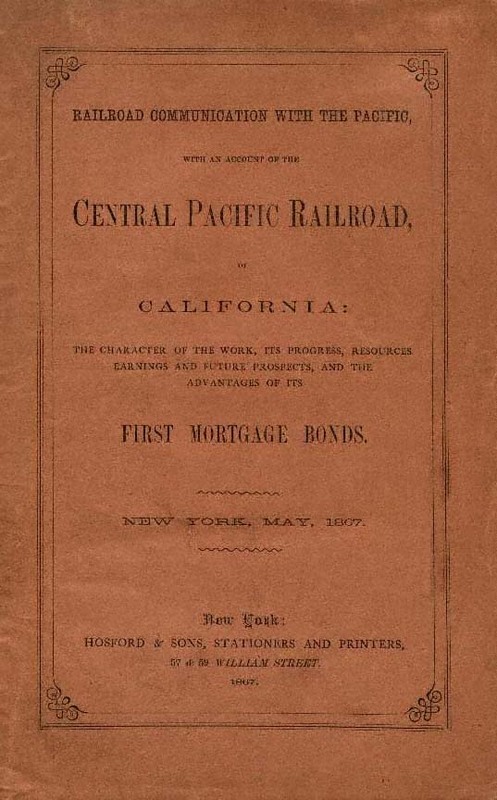 CPRR Railroad Bond Prospectus, May, 1867, Cover. "'RAILROAD COMMUNICATION WITH THE PACIFIC, WITH AN ACCOUNT OF THE CENTRAL PACIFIC RAILROAD...' New York: Hosford & Sons, 1867. 20 pp. folding color map. First edition. Original printed wrappers. Rare and important work, being the first complete report on the Central Pacific issued after the route was finally formally adopted in January, 1867. The large color map of the Central Pacific Railroad by Colton measures approximately 8 3/4 x 31 inches. (See Wheat's 'Mapping the Transmississippi West,' p. 1166 which reproduces and discusses the map.) The map is really astonishing in the quality of its detail with a wealth of fresh military fact. New place names are scattered all over the West. The boundaries of Nevada, Utah and Arizona have been revised to make the map politically up-to-date. The map in the copy shown above conforms exactly to the illustration in Wheat's book except that this map does not stop at Lake Michigan, but extends all the way to the Atlantic Ocean thus showing the trans-continental routes which will be available upon completion of the Central Pacific. HOWES C-256 references an 1868 edition of this work with different pagination, but does not note this, the first edition. No editions were in the Streeter Sale though he had much Central Pacific material nor is it recorded on OCLC. The scarcity of the work owes much to the fact that the Central Pacific archives were destroyed in the San Francisco fire of 1906. A very important western and cartographic item as well as a landmark piece of railroadiana." New York Tribune, January 15, 1868. Courtesy Timothy Hughes, Rare & Early Newspapers.